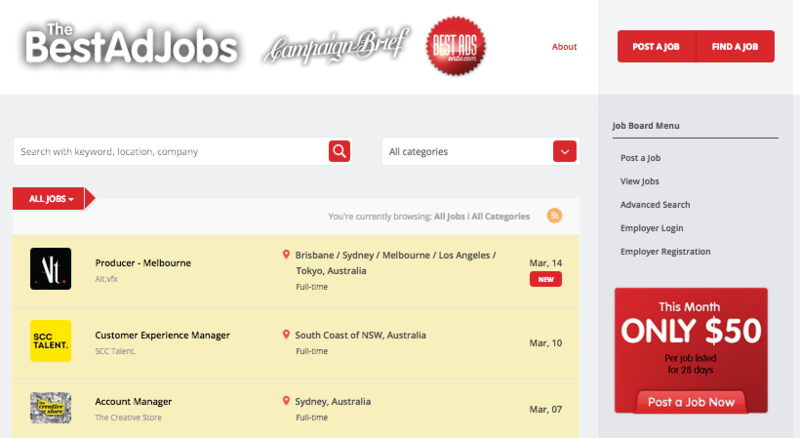 A joint initiative of Bestads and Campaign Brief, TheBestAdJobs.com offers recruiters and agencies a fantastic low rate of $50 per job listing. TheBestAdJobs.com reaches the international audience of bestadsontv.com and the Australasian audience of campaignbrief.com, campaignbrief.co.nz and campaignbriefasia.com. New and featured jobs have visibility on the Bestads and Campaign Brief sites 24/7, reaching upwards of 300,000 unique visitors a month.